Newport, Or., – The 2nd Annual Brewer’s Memorial Ale Fest was held on May 16-17th in Newport, OR and benefited Oregon Humane Societies. 3,200 people with 471 of their best friends attended the festival created in memory of Brewer, the faithful companion of Rogue Brewmaster John Maier, who passed away on May 20th, 2006. 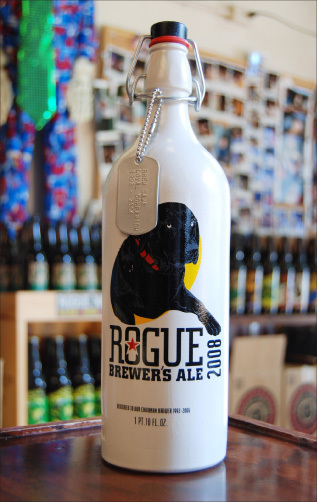 Brewer grew up in the brewery and eventually rose to the rank of CEO of Rogue Ales. The dog-friendly brew festival was held inside the Rogue Ales Brewery and included Doggy Musical Chairs, Dog Wash (pictured below), Dog Dancing, and Celebrity dog look-a-likes (Rin-Tin-Tin, Lassie, Benjy, and of course, Brewer). A premier pour of Brewer’s Ale 2008 (pictured right) and debut of 750ml ceramic bottle complete with dog tags was a highlight at the event. 50+ microbrewes were poured including Amnesia Brewing, Astoria Brewing, Bear Republic Brewery, Block 15 Brewing Co., Calapooia, Caldera, Double Mountain, Eugene City Brewery, Full Sail, Georgetown, Issaquah Brewery, Lagunitas Brewing, Laurelwood Brewing, Max’s Fanno Creek Brew Pub, McMenamins Lighthouse, Steelhead Brewery, Ninkasi, Pelican Pub, Rogue Ales, Siletz Brewing, Skagit River, Bier One Imports, Standing Stone Brewery, Walking Man Brewery, and more. In addition to the entry fee, money was raised by raffling off a Brewdawg surfboard by local artisan Steve Swann along with many participating brewers kicking in the profits from the sale of their beer. Live music was provided by Tom Varley, Whiskey Robbers, Hoodoo Johnson and Etouffee. The event featured Oregon food from Mo’s Clam Chowder, Lobster Gumbo – Newport Fire Dept, Cousin Kenny’s BBQ, Shrimply Delicious, Gary West Meats, Local Ocean Seafood, and Rogue Creamery. The event was sponsored by KG Specialties, Umpqua Bank, Rose City Mortgage, Newport Chamber of Commerce, Local Ocean Seafood, and Mo’s Restaurants. The $10 entry fee got you inside and a souvenir mug.